So, here’s an example of what makes life with JD so… interesting. He’s been working really hard over the past year to get in really good shape. Apparently, that includes making me run with him and teaching me how to box. The boxing is fun (especially because I got pink gloves), the running… not so much. Anyway, I’m getting side-tracked. Because it’s JD, he can’t just RUN, he has to find a way to make it unique… and more difficult. Running like no one else runs. So, he bought an elevation training mask, which basically creates pulmonary resistance and forces you to breathe harder than you would otherwise. The idea is that you’re building lung capacity and making yourself work harder in your typical workout. The problem with the mask (for me, anyway) is that it looks ridiculously creepy. It makes me wonder what other people in the neighborhood think when they see him running by, ESPECIALLY when he has L with him. Don’t mind us. 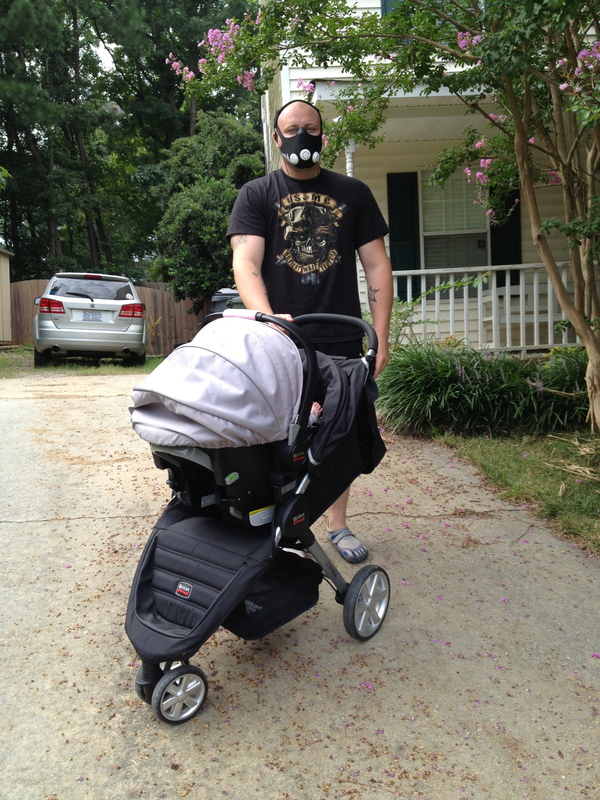 Just your typical suburban family out for a jog- mom, baby, and what appears to be Bane from The Dark Knight Rises. We were afraid someone was going to call the police on him when he was here. Just what he would have needed since he took his gun with him too. Why not? Doesn’t everyone carry their gun when they go for a run. Especially when they sound like Darth Vader when he breaths. LOL! Darth Vader- that’s SO true, hahahaha. He looks like he stole the baby!